I have a background in running and playing (mostly running) tabletop roleplaying games for over twenty years. I consider myself highly skilled in gamemastering. My library of games covers pretty much everything in terms of style, mechanics and subject matter. Some of my biggest loves are Call of Cthulhu, Vampire and Dungeons & Dragons. In this post I’m talking about Dungeons & Dragons and especially its fourth edition. It can be tricky to run, but done right, it’s the fastest “crunchy” game – something with very tangible, satisfying mechanics – around. I know there’s the fifth edition being talked about right now, but still a year or two out, so let’s concentrate on what we have right now. And besides, most of this is going to apply to a new edition, too. In order to get a new D&D 4E campaign off the ground I knew I had to be able to do it with as little time invested as possible. My schedule at work is very hectic right now. I was lucky because I have a good pool of potential players available. To get things going, I just bought the core Essentials books and agreed to have the first game next week. I had no idea what I was going to do. I’m going to assume you have players available. 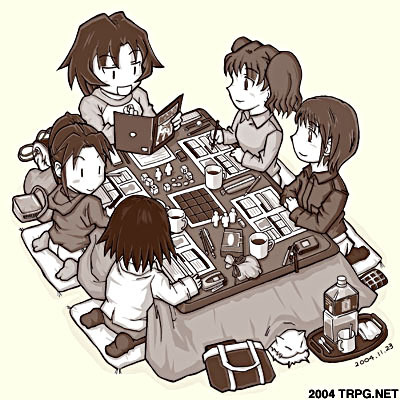 D&D has been designed for five players. You can go with four, but I wouldn’t recommend going below that as you want some extra numbers against players dropping out of sessions on short notice. What I do is keep track of potential players and bring them along as guests if need be. If you haven’t been vocal about your love for D&D, you might be surprised by how many players – veterans and lapsed and curious – there are around. Unless you’re really good in 4E already, you want to go Essentials. This saves up on (money and especially) time spent reading. You can get the basics covered in a weekend. Get the Rules Compendium, Heroes of the Fallen Lands and the Monster Vault box. The second and third character books are optional, you don’t need them for now. If you’re really familiar with D&D monsters from previous editions, you don’t strictly speaking need the monster box, either, but it’s good for background and pictures – and you shouldn’t underestimate the value of those in a game about the imagination. What Essentials does is streamlining character creation. The D&D books outside of the Essentials line have a ton of character options available, and making characters becomes a very involved process. Additionally it takes money and a lot of reading. Read through the Monster Vault book and make a list of monsters you want the players to fight. This saves time later on when you need to come up with monster of the week. Get out your credit card and subscribe to Dungeons & Dragons Insider on the Wizards website. It opens up a suite of tools and resources to you, but only one thing is really of value and indispensable when running the game: the Character Builder. You will want to use this to create and upkeep all of the main characters in your game. The other thing you get out of the DDI subscription is access to a ton of magical items and traps, which is something you miss when only using the Essentials line of books. You need a printer, too, or else you’re spending lots of time writing out character sheets. Power2ool is a free web app that frees you from paper and saves time otherwise spent writing notes by hand. Sign up and link it with your DDI account. When planning and running your sessions, you can just drag and drop monsters, traps and magical loot from DDI Compendium into your Power2ool notes. This is extremely useful and key to running the game efficiently. The monster scaling tool gives you more variety with the monster levels. Any on the fly notes you need when running the game go on the battlemat. Using wet-erase pens, keep track of initiative, monster HP, any ongoing effects, Skill Challenges and of course combat terrain. The visible information helps players focus and fosters team effort. If you don’t have dice, get multiple full sets (D4, D6, D8, D10, D12, D20). They’re inexpensive. If you don’t have miniatures, you can play without – the Monster Vault comes with a lot of cardboard counters you can use, and really any object can be a stand-in for a character or a monster. I use mostly miniatures from the Descent boardgame. Encourage your players to look for a miniature they’d like to use to represent their character. It doesn’t matter what series it’s from, as long as it’s roughly the same scale with the others. Warhammer Fantasy Battle and Pathfinder have lots of good options. If they find something they like, that binds them more strongly to the game, making dropouts and cancellations less likely, saving your time. In order to take away pressure from getting the games organized, always try to agree on the next two sessions when you’re wrapping up for the night. This way even if you have to cancel the next session for whatever reason, there’s already the next game planned. It helps everyone plan their schedules if you have a steady rhythm agreed with everyone. Every other week should fit most people’s schedules. If you have one player who just can’t commit, find someone else or agree that it’s okay if people drop-in and drop-out. To maintain player interest with minimal fuss, be clear about the campaign goals. When starting out the game, it would be a good idea to plan the entire first tier of play (“Heroic”). Make a rough outline of what should happen over the campaign up to level 10 and provide your players with goals that cover ground that far. The goals help the players concentrate and they drive the game. With the goals outlined, you only need to hint towards ways of making progress on them and your players will jump at the opportunity. This makes your job as the gamemaster much easier. Don’t be afraid of feeding the players party motivations that may not be 100% in-character in every player’s mind. It helps everyone. Make sure the players write down the goals. Example: the players’ ultimate goal for the Heroic tier is to return to their homeland. There is a series of goals they need to meet to be able to start their journey – gather allies, raise an army, raise funds. These three are major quests. Another expectation to manage is the style of play. Explain what sort of D&D game you’re going to be running and what your players should expect when they turn up for a game. Talk about themes and rules and roleplaying. This is especially important if your players are not all old buddies at the game table – there are a lot of ways to play tabletop RPGs and you shouldn’t suppose yours is the one familiar to new players. Make a list of any house rules. I made a presentation of the campaign goals for the players (PowerPoint). That way any new players can be easily given the same introduction with minimal fuss. Coming up with session ideas can be time-consuming. So do it all in advance when you have time. Over a single afternoon, you can plan your entire first tier. It’s like grocery shopping: doing it in bulk is economic, doing it while hungry is expensive and stressful. Things to consider are adventures, treasure and encounters. Planning adventures is easy using the 5×5 method: come up with five plotlines (quests). Divide them into five steps, each one a single adventure, concluding with an epic event. Drop each adventure into a place in your campaign world. There’s more to it, but just doing this, you can play in a sandbox fashion, not worrying about where your players are going to go – there’s always stuff to do, and it all ties together. Just make sure they’re aware of the ultimate goals of all five quests… and things should pretty much run themselves. I’ve added a five-step arc to all major characters, too, including the players. It helps keep a campaign running when you can think in arcs. Pre-plan treasure to minimize between sessions book-keeping. I go for complete sets of magical equipment for all the characters, pre-choosing the loot. Figure out your encounter budget and pacing. Remember to include skill challenges. You should build a rhythm to it – easy fights followed by tough fights, strings of skill challenges topped off with a tough fight, easy fights if you’re planning a roleplaying heavy session, optional fights if you want your players to have more say in the session’s direction, gauntlets where the players don’t get a rest between fights. I find it convenient to do this for the whole tier at once – that way you can build up thematically to cool boss fights and have a good idea of how many monster types are required. Done correctly, when you’re coming up to a new session, you already know what the players are going to do, who they’re going to fight and what loot they should get, and how it advances the overall campaign, with no preparation between sessions. Players coming over and you have no idead of what needs to happen in the game? Just look at your map and plot grid (the 5×5 method). Where are they? That alone should tell you what happens next. Once that is sorted, make a note of what scenes and NPCs should feature and jot them down in Power2ool. If the players are done with the current location and you want them to get a move on to advance another plot, just cut to them arriving to a new location. You don’t have to explain everything in-character or go over the tedium of choosing where to go next, unless there’s drama there. Then figure out an enemy. You should vary your fights, but D&D lives and breathes through its combat. Thus for every session you should have an opponent in mind the players can fight. Once you have something chosen from your list of cool monsters to fight, locate its card in Power2ool. Pick one or two supporting monsters to round out the encounter. Pick a place for the fight. There should always be an interesting thing about the set the fight is placed in. You should draft a list in advance of things you could use – movement limitation, dangerous areas, traps, timed obstacles, risky advantages, opportunities. Then figure out a twist to the encounter. Is there a time limit? What is the objective – it should rarely be just defeating the opponents? Finally, decide when to stage the fight. Sometimes you should open with it, with characters already in the thick of it, sometimes you should let the players plan for it, sometimes you should surprise the players in the middle of roleplaying. Avoid concluding the session with the fight unless you’re good in time management. Even a great fight can be ruined by players getting antsy about catching the last bus home.